This massive campaign book clocks in at 227 pages, 1 page front cover, 1 page ToC, 2 pages of editorial, 1 page SRD, 1 page back cover, leaving us with 221 pages of content, so let’s take a look, all right? Now, if I utilize my usual level of detail and analyze everything down to the feat-level, we’ll be here next Christmas, so please bear with me while I present this book’s content in slightly broader strokes. After introductory prose and well-drawn maps as well as a general introduction, we begin this book with the section on races, discussing the core-races and their roles within the setting of Aden first – though it should be noted that there are no default gnomes, halflings or half-orcs here – instead, there are A LOT of new races. The Faerkin would be basically the replacement for gnomes – flavorwise, they have ties with the fey, which translates to various alternate racial traits that represent this – Quickling blood increases base speed to 40 ft., for example – generally, I like this race – it’s pretty well-balanced, though the aforementioned racial trait lacks the “ft.” after the 40. Ferrans would be a race that all fans of werewolves and anthropomorphic animals will love – they are an artificially created race, intended for servitude, though by now they have claimed freedom via a massive insurrection – this war did leave its mark on the race, though – the avian and reptilian ferrans are extinct and now, only the mammalian ones remain – which is, balance-wise, probably a good thing. With either claws or bites, movement speed customization. Here’ I’d like to thank the authors – not only have they concisely defined natural attacks, less experienced players also have the rules explained to them – nice one! Btw. : Ferrans come with two complete, alternate racial suites for brutes and sneaks – oh, and the race can select from a list of 3 different bestial abilities to account for the race’s diversity. While the ferrans are a powerful race, it’s not one that suffers from feature bloat or the like – my playtest did show them to be most appropriate from standard to high fantasy and less so in gritty low-fantasy scenarios, but admittedly, they can function in such contexts as well. Well-crafted one. Here would be, btw., as good a place as any to mention that alternate racial traits etc. tend to favor untyped bonuses, not racial bonuses – so if you’re a consistency stickler like yours truly, you might be somewhat annoyed by that. And before you pull out the pitchforks – yes, I am aware that not all published races adhere to this convention either – it just would be nice if they did. The Goreaux would be Aden’s goblin-ish race…and they are extremely smart – with a focus on mechamagic and a focus on brilliant minds, they are an interesting race. That being said, they do gain +4 Int, which is something I am not a fan of, since it makes the race lopsided and ultimately makes them predisposed towards certain pursuits…and such increased bonuses tend to result in higher powered builds. The Jurak, highly adaptable survivalists, would be the stand-in for the half-orc -and once again constitute a great race – diverse, adaptable, interesting. Nice one! Rapacians would be the lizard-folk-ish race of Aden, though they are not primitive. Personally, I’m not a big fan of them getting bonuses to 2 physical attributes, but this is somewhat balanced by them being more straightforward regarding other racial traits – so yes, these guys get a pass from me. Then, there would be the echoes -blank slates of black in humanoid form, they are relatively recent creations…and these creepy-looking individuals may alter self – but only the form of a deceased humanoid, and only if they can secure a component of the humanoid to be integrated into their jewelry/vials/etc. This race is balanced, creepy and all awesome…however, I think the Transient Echo-abilities ought to specify that is Su in the ability-header, not just in the text – and yes, this is the nitpick-level that will not influence my final verdict. The Ilthix Exile, insectoid exiles of their alien insectoid race, get +4 Dex, -4 Cha, making them pretty lopsided. Worse, the race gets unassisted flight at first level, hive sense and non-verbal communication. This is the very picture-book example of a lopsided race and the unassisted flight before 6th level can be quite problematic. That being said, at least the fluff makes these guys suffer for their powerful abilities. This chapter btw. also contains favored class options for the new classes herein – there are a lot of them and chapter 2 is devoted to them. The race-chapter also sports age, height and weight-tables, common names, information on languages, etc. So now, we’ll take a look at the new classes – 9 of them. Seeing how one in-depth class analysis usually tends to cover 4+ pages, I’m going to instead focus on a broader strokes picture. The first class would be the Arbiter – at d12 and Full BAB, these guys are the agents of law and order, gaining e.g. class level as bonus to 3 skills, the class can be considered a more martial inquisitor in theme, with the talents granted at 3rd level and every two levels thereafter providing some customization. Theme-wise, arbiters would be tanks – with a focus on using shields, they can attack and AoO even in total defense and increase the power of these tricks. A solid blocker class – no complaints here…apart from the 10th level ability missing from table and write-up. Like all classes herein, we get information on how the class may be played via the example of numerous sample fluffy character backgrounds. The Entomancer at d8 would be an alternate class of the druid (nicely done – quite a few authors fail in pointing the like out, resulting in multiclass issues…) and are all themed around “insects” – not vermin, mind you, insects – the definition of this term is pretty concise. Player agenda is emphasized by providing multiple insect mastery-groups – these can be pictured as collections of talents: Unlike bloodlines or orders, entomancers are not restricted to one, but may freely choose between them…however, the respective categories have prerequisites within, thus rewarding specialization in a given way. Once again, on the nitpicky side, I can complain about the prereqs e.g. once depicting the required masteries known as “two” and then as “2” – but once again, this is a cosmetic issue and will not influence my final verdict. From cricket to hawk moths, the companion-steeds provided are pretty cool and options for verminous scouts and swarms add quite a bunch of interesting narrative options – espionage in Aden can be pretty compelling. Oh, and yes, this would be horribly broken, but the loss of 3 schools means that the class needs the golems and actually proved to be a valid trade-off. The single most defining event of Aden is 10 years past – the Darkfall. The very sun itself was extinguished for a short period and the whole world saw a sudden genesis of creatures from the very nightmares, the subconscious of the populace, suddenly springing to life. The offspring of this cataclysmic event’s dread unions would be the Corrupted. However, some do not serve – these beings would be the Fallen, people born from the Darkfall, yet striving to resist its call. 2 good saves, d8 and 4+Int skills point towards a skirmisher -and indeed, they are – with an addition: They bear stigma, which they can use to channel debuff effects, so-called torments, which scale, btw., on nearby foes – think of a mechanic somewhat akin to an antipaladin’s cruelties, but at range. Additionally, the fallen can choose a type of stigma, which can be likened to an order or bloodline in that it provides a scaling array of abilities and determines the bonus feats available. I generally like this class and enjoy the fluff immensely, but it does suffer a bit from sharing the same niche as Forest Guardian Press’s excellent direlock, though surprisingly, the two classes gel very well with one another. The manite implants of mechamagic have an unfortunate side-effect -the Wasting. At the same time, extremely modified creatures with a strong sense of dedication and loyalty seem to resist this effect -enter the Golemoids. At d10 and full BAB-progression, Golemoids gain a reserve of steam points with which they can activate their implants and, beyond interchangeable parts and combat specializations, these guys can be pretty much considered to be the robot-class of Aden, with 4 classes of manite implants offering a rather diverse array of options to choose from -e.g. rocket-powered fists. Yes, this class is pretty awesome! The Mechamage alternate wizard-class would be an int-based full caster, with no access to enchantment, illusion and evocation. The interesting component here would be that the class gets a golem minion he can call to himself – or rather, as many as he can afford. You see, while only one such minion can be active at a given time, the mechamage can have multiple ones with different customizations – doll golems, for example. Basic golems are pretty dumb and thus, the commands they understand are carefully noted…oh, and want to do something different? There are writs and they make an otherwise been there, done that pet-class interesting: Essentially, you have pieces of writing, cogs, etc. you prepare (at cost), which you feed to your golem, programming it. And yes, love how this reflects the legend of Rabbi Loew’s golem. New writs are unlocked at 3rd level and every 3 levels thereafter for an integrated scaling mechanism. The seer, who gets all good saves, 3/4 BAB-progression and d8, looks somewhat like a monk, but also gets Wis-based spellcasting from the class’s own list. These rare beings, gifted with the power of prophecy, rank first among the Darkfall’s hitlist – and as such, these beings are RARE. The class is interesting in that it utilizes its fatebending prowess via a significant array of customizable auras, some of which are powered (or can be enhanced) by a growing pool of second sight tricks. This class ranks among my favorites herein – unique in niche and presentation, the seer can provide narrative gold and remains an awesome addition to other settings and systems as well. The steamwright, at d8 and good will-saves + 3/4 BAB and can be considered a super-science-tinker-class, with the closest analogue probably being Alexander Augunas’ Technician from the awesome “Age of Electrotech“-book. The interesting component here would be the variable pool of firepower-bonus damage that can be added with quite some flexibility to the damage-dealing components of the steamwright’s arsenal. The inventions featured, from various guns/cannons to audiographs that can record what is heard, furthermore come with options to modify them – both invention-specific and general modifications. This class proved to be pretty powerful in playtest, though not to a point where I’d start complaining, especially since it does offer a neat array of awesome narrative options and non-combat utility. The Thaumaturge has a full caster’s chassis and all bad saves and they may draw upon legends – the manifestations of how people are remembered (as opposed to how they were) – these legends are called forth and bound – and they modify BAB, feats, skills, etc., while also granting abilities – this class is essentially a dilettante-like class with a truly unique and compelling fluff. Interesting, btw. – the legends have aspects which provide a passive benefit and one more powerful consume ability, which renders the aspect inert until it’s reactivated. This class is very interesting – it is extremely weak when caught on the wrong foot, but makes for a great class for solo-adventures or small groups that need multiple roles filled. Beyond that, an interesting conglomerate of narrative tricks can render this class in game pretty awesome – what if a legend’s perception changes and a thaumaturge is invested in the legend’s ideal? A good GM can craft some inspiring yarns from this class. Did you always want to play the badass pilot on a rumbling micro-steamtank or a jetbike? With full BAB, two good saves, minor spellcasting and a customizable signature vehicle, the thunder scout class is THE class for you – with numerous talents and customization options (and spells pertaining the vehicle), we get an awesome class with one annoying oversight – the vehicle’s dimensions and weight are not explicitly stated – while one can take the vehicles later as orientation, I still considered this annoying. The book also sports numerous so-called folk-magic traits – essentially a toolkit that allows you to cast a single 0-level or 1st level spell as an SP, with CL being locked at 1st level – neat idea! As a nice note – traits utilize the often forgotten trait-bonus type. The pdf obviously sports numerous feats for the significant array of new classes herein -from better piloting to more techniques. Beyond these, support for multiclass monk/sorcs that let them use Wis instead of Cha and similar enabler-type-feats are provided alongside feats that extend the powers of a given racial ability. The chapter also details new uses of Knowledge (engineering), Heal and the rules for Craft (Machinery). After all of this, we dive into a concisely-written history of the world of Aden, which thankfully does not manage to get bogged down in the details, though a significant array of intriguing events are touched upon, before notes on languages, cosmology, calendar, wildlife and agriculture and so much more are provided – in spite of the relative brevity of this chapter, it, surprisingly, managed to captivate me. Major and minor religions, organizations (including a handy Pathfinder Lodge-stand-in) provide more than enough potential allegiances to have and share – though you should note that the religion write-ups are not particularly crunchy. After this particular section, we dive into the nit and grit of the history, lands and politics of the massive nations that shaped Aden, noting governmental type, major imports and exports and predominant races – you won’t find a detailed break-down of these components here, nor (thankfully) the rather annoying alignment-based nation-stereotyping. At the same time, military and similar crucial components are touched upon – and the respective nations sport their own full-color flags, which is a more than nice touch. Now something I touched upon before becomes much more important in Aden: Magic works differently: Divine casters are not restricted in domain choice by their deities – instead, they may freely choose domains; their belief shapes the power they command and the absence of gods in the traditional sense opens, obviously, the way for numerous heresies and ambiguous options – which is kind of awesome. At the same time, I consider free domain-choice highly problematic – there is a reason domains are grouped for deities – some are simply better than others and being able to cherry-pick domains is not something I’d advise a GM to let her players do. The chapter also, obviously, contains a significant array of new spells – as mentioned before, these interact (often) in unique and interesting ways with the mechanics introduced in this book and several new, unique spells that e.g. deal with constructs, piloting, etc. Some spells also feature an interesting mechanic that makes repeat casts more likely to succeed. Clothing yourself into your swarm of insects would be one intriguing option, to give you an example. The most intriguing chapter of this book, at least to me, though, would be the one on technology: From the basic concept of manites to the steamreaver mecha-weapons used by golemoids. Firearms in Aden operate btw. via different rules than those presented in Ultimate Combat – the crit multiplier is smaller, they do not ignore armor and suffer no failure-chance. An interesting array of weapons is presented here, with several pretty nice artworks – though their style does not live up to some of the most stunning artworks in the book. Siege and vehicle weapons alongside a significant array of the latter, from thunder cycles to steamwagons and dragon gliders can be found in this chapter with full stats. Alchemical items poisons complement this section with some cool ideas, though e.g. alchemical oil lacks the obvious “fire” damage type it should inflict, at least judging from the item’s fluff. Manite-powered items and implants (along the aforementioned threshold that you should not overstep…) and the process of golmization are intriguing – much like Shadowrun’s Cyberzombies, these beings may gain power, but also lose parts of their humanity – and the slow death sentence of the wasting constantly looms, putting these rules once again in the hands of the GM and the story to be crafted. Especially the rules here are great – e.g. alternate options that make the manite threshold unknown to the player and similar gritty options to evoke questions of humanity make this section top-notch in the inspiration-category. The greatly expanded and streamlined section of vehicle combat and customization also renders this component significantly more pronounced (and interesting) than I would have thought -with vehicle maneuvers, speeding thresholds and the like providing a rather exciting array of tactical options. This pdf’s rules to avoid constant (and pretty meaningless) skill-checks for basic operation definitely are appreciated! I consider the rules herein more suited and closer in line to my own take on the concept, so yeah – kudos! The book also sports a bestiary – on the plus-side, the awesome full-color artworks here should definitely be considered awesome and on par with the best out there. On the downside, most statblocks in PFRPG sport a very *DISTINCT* separation from offense, defense, etc. – while this is maintained, its visual cue is less pronounced – the respective headers for the statblock sub-sections are just as small as the rest of the text, which makes reading the statblocks slightly less comfortable than they should be. We end this book with a brief treatise on the Darkfall, some fluff-only renditions of powerful corrupted and a handy index that facilitates utilizing this book. Editing and formatting are very good on a formal and rules-level – while I noticed quite a few small inconsistencies and minor hiccups, they did tend towards the type that does not (overly) impede the book’s usefulness. Especially considering that this is the first book of Kyoudai games, you can color me intrigued for any further Thunderscape material. Layout adheres to a beautiful, yet still relatively printer-friendly two-column full-color standard. The book sports MANY original, beautiful full-color artworks – though the weapons and races fall a bit behind the otherwise Paizo-level artworks. Yes, this is a beautiful book. The pdf comes fully bookmarked with nested bookmarks for your convenience. Don’t start with the campaign setting. It’s an old truism and one that mostly holds true – a campaign setting requires great fluff, great crunch, a big budget and it can go wrong in many, many ways. It requires a plethora of skills and is HARD to pull off. More so even when attempted for an established setting – even if that setting has not so far seen too much exposure. Let’s cut this short, shall we? Due to the unique options of Thunderscape, playtesting this took forever -there are many entwined components that require one another. Surprisingly, the rules-language employed is pretty precise even when tackling rather complex concepts. More surprising than that, though, would be the fact that the new classes, more often than not, offer a pretty unique playing experience. Shawn Carman, Rich Wulf and Christopher Koch have definitely excelled beyond my expectations in this book. 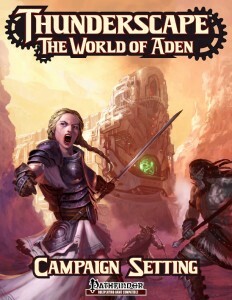 Aden, as depicted herein, came more to life for me than it ever managed in the games of old – to the point, where I actually consider this a thoroughly compelling campaign setting I will gladly revisit. Granted, there is some sand in the finer components of the otherwise pretty well-oiled machinery that is this book, but seeing that this *is* a freshman offering, not for the authors, but for the company, and I’ll gladly rate this 4.5 stars…and since I really enjoy the majority of choices herein, since the book offers so much coolness to scavenge and/or use, I will round up and slap my seal of approval on this book. On another note – from now on, you’ll also see Thunderscape-supplement-reviews, provided I can get my hands on them – I’m definitely intrigued to see whether they can live up to the excellent quality established in this book. You can get this high-quality, mechanically-inspired setting here on OBS and here on d20pfsrd.com’s shop!